Previously undiscovered diaries have been found by an author based in the UK which show the intense relationship between Queen Victoria and the Indian man employed to be her teacher. The diaries have been used by London-based author Shrabani Basu to update her book Victoria and Abdul - which tells the story of the queen's close relationship with a tall and handsome Indian Muslim called Abdul Karim. The diaries add weight to suggestions that the queen was arguably far closer to Mr Karim than she was to John Brown - the Scottish servant who befriended her after the death of her beloved husband Prince Albert in 1861. They show that when the young Muslim was contemplating throwing in his job, soon after his employment started, because it was too "menial", the queen successfully begged him not to go. 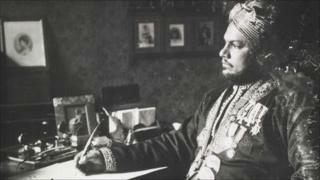 He and his wife were given residences on all of the main royal estates in the UK and land in India. He was allowed to carry a sword and wear his medals in court - and was permitted to bring family members from India to England. "Mr Karim's father even got away with being the first person to smoke a hookah [water-pipe] in Windsor Castle, despite the queen's aversion to smoking," Ms Basu said. "The queen's munshi was named in court circulars, given the best positions at operas and banquets, allowed to play billiards in all the royal palaces and had a private horse carriage and footman." That Mr Karim inspired the empress of India could be seen not just by her newfound love of curry. Her eagerness to learn Urdu and Hindi because of his teaching was so strong that she even learned to write in both languages - and gave him a signed photo written in Urdu. She also used his briefings on political developments in India at the turn of the 19th Century to berate successive viceroys, her representatives in India - much to their displeasure - on measures they could have taken to reduce communal tensions. "At a time when the British empire was at its height, a young Muslim occupied a central position of influence over its sovereign," Ms Basu said. "It was a relationship that sent shockwaves through the royal court and was arguably a relationship far more scandalous than her much reported friendship with Mr Brown." On meeting Queen Victoria for the first time: "I was somewhat nervous at the approach of the Great Empress... I presented nazars (gifts) by exposing, in the palms of my hands, a gold mohar (coin) which Her Majesty touched and remitted as is the Indian custom." Quoting a letter written by Queen Victoria imploring him not to resign: "I shall be very sorry to part with you for I like and respect you, but I hope you will remain till the end of this year or the beginning of the next that I may learn enough Hindustani from you to speak a little." On 'good fortune': "Some Indian jugglers happened to be in Nice while Her Majesty was there. When Her Majesty came to hear of them she sent a request to have them brought before her to exhibit their tricks. The Queen was highly amused and delighted - and the honour which was given to these poor jugglers must have made them happy for life." Such was the level of ill-feeling he generated that barely a few hours after the queen's funeral, her son Edward VII unceremoniously sacked Abdul Karim. In addition, he ordered that all records of their relationship - kept at Mr Karim's homes in India and the UK - should be destroyed. But remarkable detective work by Ms Basu in India and Pakistan unearthed Mr Karim's diaries - kept by surviving family members since his death in 1909 - which detail his 10 years in London between Queen Victoria's golden and diamond jubilees. The diaries and other correspondence were taken back to India by Mr Karim and his nephew, Abdul Rashid, after their dismissal and were in turn sneaked out of India to Pakistan 40 years later when his family migrated during the violence at the time of partition. A surviving family member in India read about Ms Basu's book in a local newspaper and told her that the diaries were being kept by another branch of the family in Karachi, which she duly tracked down. "I was fortunate enough to have unearthed a truly remarkable love story," Ms Basu reflected. Shrabani Basu's updated book, Victoria and Abdul, is published by the History Press.